The diagram below represents the main biological relationships to Sam and Dean. You're also Winchesters. As long as we're alive, there's always hope. Dean Winchester - The eldest son of Mary and John, brother of Sam, half brother to Adam Milligan. Sam Winchester - The youngest son of Mary and John, brother of Dean, half brother to Adam Milligan. Mary Winchester (née Campbell) - Wife of John, mother of Sam and Dean. Daughter of Samuel and Deanna Campbell. 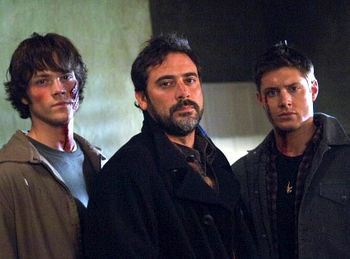 John Winchester (Deceased) - Husband of Mary, father of Sam, Dean and Adam Milligan; son of Henry Winchester. Henry Winchester (Deceased) - Grandfather of Sam and Dean, and father of John Winchester who disappeared in 1958 only to arrive in 2013 and die at the hands of Abaddon. After Henry's disappearance in 1958, John may have been raised by a step-father, grandfather, or uncle, referred to as his 'old man' in 1973. Millie Winchester (Deceased) - Wife of Henry Winchester and mother of John Winchester. Samuel Campbell (Deceased) - Father of Mary. Deanna Campbell (Deceased) - Mother of Mary. Kate Milligan (Deceased) - Lover of John Winchester, mother of Adam Milligan. Adam Milligan (Deceased) - Son of John Winchester and Kate Milligan, half brother to Sam and Dean. Emma (Deceased) - Daughter of Dean and the Amazon Lydia. A wise man once told me, 'family don't end in blood.' But it doesn't start there either. Family cares about you, not what you can do for them. Family's there; for the good, bad, all of it. They got your back, even when it hurts. That's family. Bobby Singer (deceased) - Surrogate father figure to the boys from their childhood. He definitely considered Sam and Dean to be his sons - "As fate would have it, I adopted two boys. And they grew up great. They grew up heroes." Castiel - Dean tells Castiel that he is like a brother to him and Sam. Charlie Bradbury (Deceased) - An ally of the Winchester boys. Dean claims that "She's kind of like the little sister I never wanted." Even Charlie considered the Winchester boys her brothers. Kevin Tran (Deceased) - Dean tells Kevin that after everything he's been through with them, Dean considers Kevin a member of the family and that each other, Sam and Castiel are all they have left in the world. Kevin apparently considers Dean the same as he stays when Dean tells him to leave if that means nothing to him. 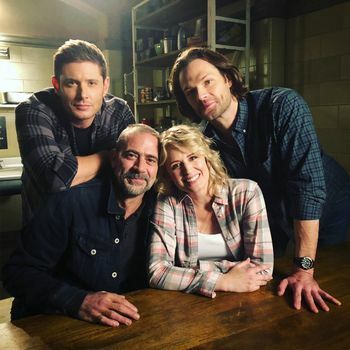 Benny Lafitte (Deceased) - After their time together in Purgatory, Benny and Dean have a close friendship, close enough that Benny calls Dean "brother," something he doesn't rebut and he trusts him to save Sam and Bobby. Benny never betrays Dean's trust and friendship. Sam resented Benny the entire time they knew each other, but he eventually accepts that he's different from other vampires. Although they knew met for a very brief window, Bobby also brings himself to trust Benny, who helps him escape from Purgatory to ascend to Heaven. The Impala - Definitely a member of the family. Before moving into the Men of Letters Bunker, the car acted as Sam and Dean's home. Jessica Moore (Deceased) - Sam's girlfriend while he was at Stanford. He was about to propose to her when Azazel had her killed by Brady, in order to force Sam back into hunting. Lisa Braeden and Ben Braeden - Dean had a brief affair with Lisa when he was young, and he looked her up when he was in his last year following his deal with the Crossroads Demon. Dean returned to them following Sam's sacrifice to imprison Lucifer. He lived with them for a year. Eventually, he asked Castiel to wipe him from their memories, due to the danger and violence he felt he brought to their lives. Amelia Richardson - Sam had a relationship with Amelia for the better part of a year, while Dean and Castiel were trapped in Purgatory. They lived together in Kermit, Texas. The relationship ended when Amelia's husband Don Richardson, returned after having been presumed killed in action in Afghanistan, and Sam chose to return to hunting over staying with Amelia. Campbell (family) for more relatives on Mary's side of the family tree. This page was last edited on 22 April 2019, at 22:17.